Today, organizations run lean and employees are expected to be smart, fast and versatile. The same holds true for MFPs. These Systems gives you all of that—and more. Powerful management tools make it easy to build and maintain highly productive workflows to streamline your document-related processes. Plus, a host of physical and logical security features give you multiple ways to protect your documents and your data. Exceptional performance from features such as internal finishing makes it a perfect system for centralized printing environments so you can get rid of the hassle and expense of multiple personal printers and produce professional-quality documents in-house. 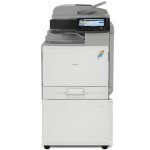 ● Keep every job on the fast track with reliable print speeds of up to 20 pages per minute. ● Use the productive duplexing feature to print two-sided documents. 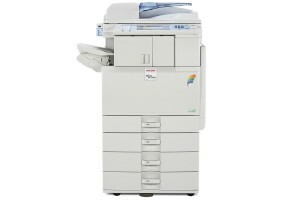 Get the double advantage of greatly reduced paper costs and more efficient document filing. ● Use less power without changing workflow. The innovative new color Quick Start-up (QSU) fusing system heats up quickly, using less electricity to do the same work and allows faster recovery time of less than 10 seconds from sleep mode where it only consumes 1 watt. All this leads to one of the lowest Typical Electricity Consumption (TEC) values in the industry. ● Conserve valuable office space with a compact system that can be configured to meet your specific needs. You can even add in-line finishing capabilities with just a minimal increase to the system’s footprint. ● Manage simple tasks or complex jobs easily with the 8.5″ full-color LCD display. The intuitive display allows users to preview stored documents for accuracy prior to printing — and view animated guidance for operational assistance. ● Replenish paper and supply items quickly with a user-friendly design that includes overhand/underhand grips on paper trays and simplified, singlehanded toner replacement. ● Complete jobs of all sizes faster and easier with a 600 MHz processor, 1.5 GB RAM and a 160 GB Hard Disk Drive. ● Streamline and simplify print jobs with icon-driven Ricoh one-click, preset PCL6/PS3 user interface drivers as well as XPS and optional genuine Adobe® PostScript®3™ drivers. ● Build a powerful, reliable network with seamless integration for Windows, Macintosh, UNIX, AS/400 and other environments. Standard 10Base-T/100Base-TX Ethernet, USB 2.0 and SD Slot interfaces, as well as optional Gigabit Ethernet and wireless connectivity, are also available. ● Send scanned documents to any e-mail address at the touch of a key with Scan-to-Email. No dedicated servers or additional software are required. ● Save documents on a shared server for fast, easy distribution with a productive Scan-to-FTP feature. You can also send scanned documents to a local server for intelligent archiving with Scan-to-Folder. 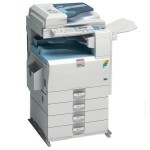 ● Scan or print documents directly from a USB memory device or SD memory card with Scan-to-Media. This makes document portability fast and easy. ● Reduce the file size of color documents with an easy-to-use High Compression JPEG 2000 PDF feature. 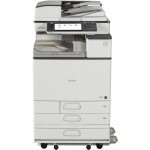 This resolves the issue of large documents slowing down your network and the printing process. ● Produce professional finished documents without taking up excessive floor space. 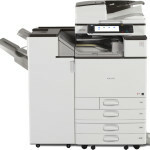 Both systems offer an internal finisher, which offers automatic stapling and optional 2- or 3-hole punching. ● Create spreadsheets, newsletters or other large documents on 11″ x 17″ paper using the copy or print functions. 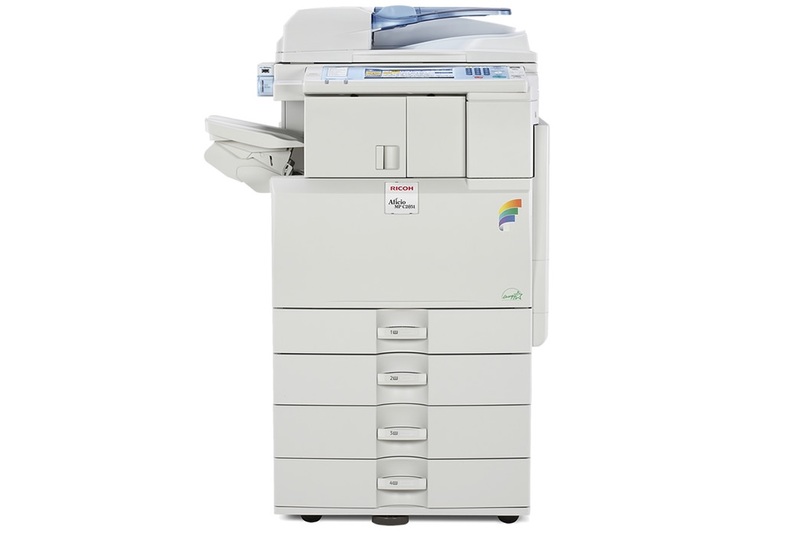 ● Push workgroup productivity to new heights with an ample paper supply. The system offers a total paper capacity up to 1,600 sheets, a standard 50-Sheet Automatic Reversing Document Feeder and up to five paper sources. ● Produce full-color or black & white postcards, posters and report covers on a variety of thick or unique paper stocks. Or print onto envelopes directly from the envelope feeder tray or bypass tray. 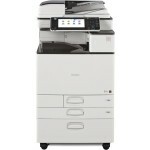 ● Send fax documents quickly and easily with an optional Super G3 fax modem and 2,000 Quick Dials. 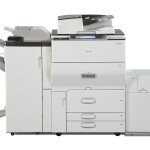 ● Cut costs with advanced LAN, IP (T.38) and Internet (T.37) faxing technologies. ● Monitor and manage this device from a remote location using advanced Web tools. Administrators can view system details, settings and supply status from a standard Web browser. ● Optimize your most critical workflows with the Embedded Software Architecture™, a Java-compatible Software Development Kit (SDK) that makes it easy to create unique system and network management applications. ● Create full-color or black & white documents from a PDF or JPEG attachment by sending an e-mail directly to the system using the innovative Mail-to-Print feature. ● Save time and minimize network traffic with PDF Direct Print, a convenient capability that allows end-users to print PDFs without having to open them in Adobe® Acrobat®. ● Charge specific print jobs to specific clients, workgroups or job numbers using the advanced but easy Classification Code feature. ● Connect any PictBridge®-enabled digital camera to the system and print brilliant, full-color photos in seconds. ● Control expenses with a powerful combination of high-productivity, long-lasting reliability and low total cost of ownership (TCO). ● Place the right device for the right application with these systems and other —all part of our extensive line of products. ● Provide strong lines of defense for sensitive information with the standard DataOverwriteSecurity System (DOSS). This robust security feature automatically overwrites the hard drive after each job. Standard HDD encryption lets youprotect valuable data, even if the hard drive is stolen. ● Guard against unauthorized document viewing with encrypted PDF transmission. This feature encrypts PDF data prior to transmission via Scan-to-Email and Scan-to-Folder. ● Protect e-mail transmissions with advanced encryption technology and defend against unauthorized network interception with S/MIME (Secure/Multipurpose Internet Mail Extensions). 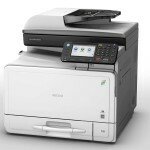 ● Print color documents without worrying about costly overuse. Several levels of authentication let you confirm user identity and control access to color, scanning and other functions.